Hey bud, just bought one myself Monday. Been asking around for weeks, my brother and many others suggested doing a 3/2. Three inch lift in front and 2 in back. If you wait until Tuesday I will put some pics up on this thread. Having bags put on and the 3/2 on Monday. Here’s mine, love the ride and glad I finally made the move back to half ton from F250. Beside couldnt afford a new super duty. Lol. Low Range Off-Road is what I decided and it's a super high quality machined aluminum kit. I was super happy with it and it was somewhere around $200. Put one in my dad's Taco as well. 3/1 lift level is perfect. For periodic heavy hauling I used ARB bags in the back. 200 bucks? You self install? Interested in more info, please. tagged, I have the Platinum with 20" wheels and need to know this same info. My 2016 has a 3 & 1 on it. Sits perfect IMO. Not sure what brand it is bc I bought the truck that way from Toyota. Is this a 2 wheel drive?? 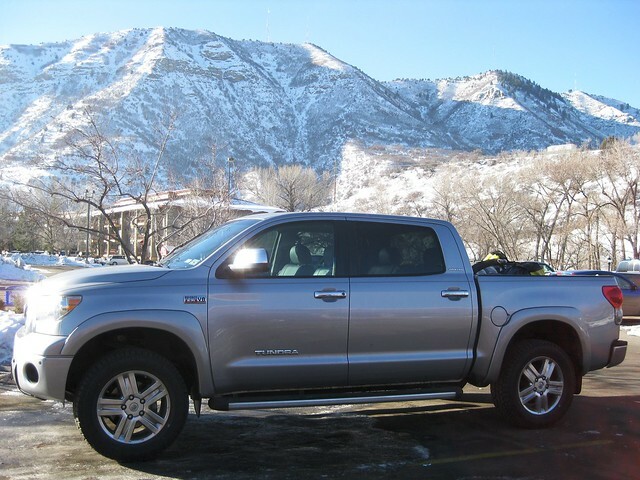 I just got a 2019 TRD SPORT. From what I’ve read, you can’t exceed 1 3/4” lift in the front without dropping the front diff. Has to do with maintaining proper angle on front cv axles. My friend owns a 4x4 shop, he says most requested and best look is 3/1 on a tundra. Does anyone have the rough country 2.5-3" kit? That’s what I paid including alignment. It took them several hours. You are correct, the right way to do it is always to lower the front diff. People just don't do it because otherwise the lift would be too expensive. So parts wear out faster than normal. Since a lot of people rarely use the 4wd (That's why trucks went from solid front axles to IFS in the first place), it's usually not an issue. Your talking a bad CV joint at 100k vs 150k miles by not lowering the diff. Rough Country....paid around $700.00 to have it done but it is something you can do yourself. I previously did the same lift on the Titan i had. Did have to trim the skid plate a little on the Tundra after the lift was installed. I haven't done mine yet, but, the Bilstein's 5100 are popular for leveling. 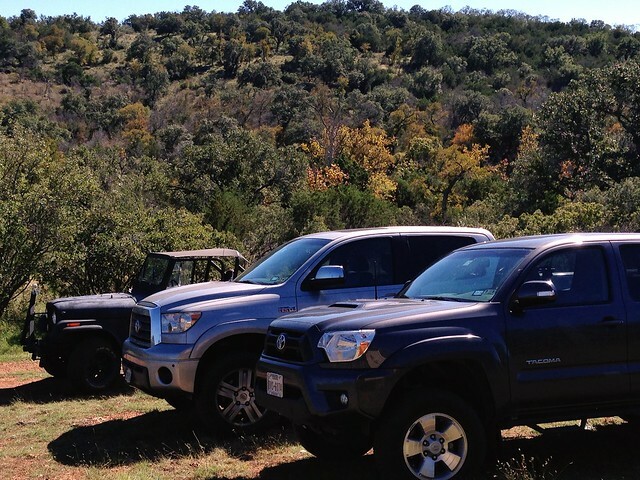 Search the 2 or 3 Tundra forums. Its a new 2018 4x4. My brother has the same but a 16 and he did the 3/2 and its worked well for him. But considering a 3/1 now seeing the others. I have a 2018 4X4 that has bilstein 5100's on the front set on the second setting and I changed out the rear shackles to custom coachbuilder 3" shackles. It stiffened up the rear so there isn't sag when I am loaded down and made the ride awesome with changing out the bushings to poly. I'll post a picture. I got plenty of lift both front and rear and its a very functional set up as I haul and pull frequently. Love that cement color, nice truck! Those TRD models come with bilsteins, did you add the 5100s? They come with the billy 4600's so I upgraded the front to 5100's. It doesn't really show that it's much difference but I am running 34" tires (basically 35's) on 18" wheels and it's a heck of a difference. I am glad I have the running boards or I wouldn't be able to climb in nearly as easy lol. Hunt In: Your tree stand. I'm running Bilstein 5100 and Nitto Ridge Grappler 295/60/20 on my '15 Limited with stock wheels. Had to do a touch of trimming, but minimal. Added wheel spacers to give a wider stance. Better stance and look. Sits like the TRD Pro, with a little wider stance. 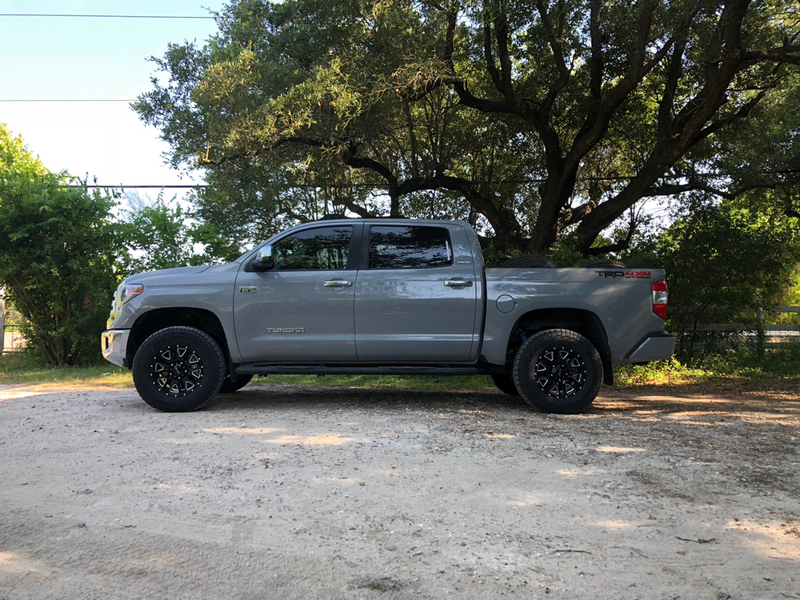 On my TRD Pro, I went with coachbuilder shims and shackles and would recommend going that route to anyone. Nice! Where at? Here in dfw? What shop did you use or can anyone recommend a shop in the Ft Worth area? That is a clean lookin tundra right there. Thanks bud. I like her too lol.